LOS ANGELES – Razer™, the leading global lifestyle brand for gamers, today announced the launch of the Razer Raiju Mobile and Razer Hammerhead USB-C ANC along with its brand-new Razer Phone 2 – completing the mobile entertainment and gaming experience. The Raiju Mobile controller is a mobile gamepad with a phone mount and Bluetooth connectivity that brings a full-fledged console gamepad to mobile gaming. Featuring four remappable multi-function buttons, Razer™ Mecha-Tactile action buttons, a hair trigger mode and an adjustable phone mount, gamers get enhanced precision and perfect viewing angles for their favorite mobile games. A mobile configurator app allows advanced customization for a personalized setup. The Razer Raiju Mobile supports flagship Android phones and the biggest titles in mobile gaming, which include “Vainglory,” “Lineage 2,” “Dead Trigger 2” and “Gear-Club,” and many more. 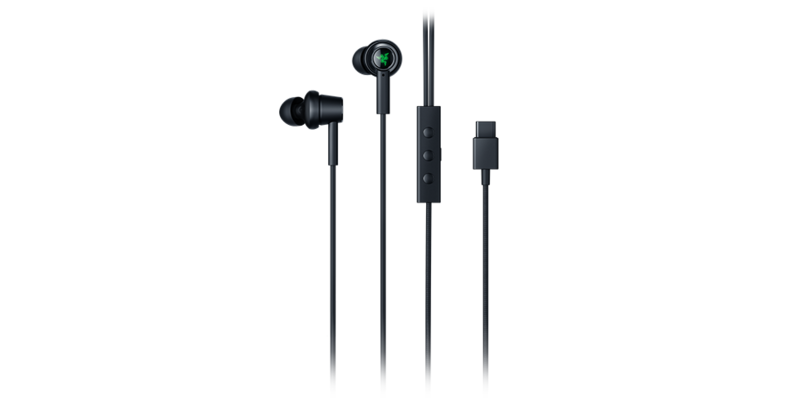 The Razer Hammerhead USB-C ANC in-ear headset delivers superior immersion on-the-go in a small, discreet form factor. It draws power for its Active Noise Cancellation (ANC) technology though the USB-C port on your smartphone. This enables the noise cancellation capabilities of larger headsets without the bulk. It has stellar audio quality through its Dual Driver technology featuring a combination of balanced armature and dynamic drivers to deliver a perfect balance of deep bass and detailed trebles. A built-in digital to audio converter (DAC) provides 24 bit/96 kHz audio quality for clear, uncompressed sound. The headset is also fitted with Comply™ Foam Tips for maximum comfort, a secure in-ear fit, and enhanced noise isolation. This combination provides for an immersive sound stage, free from distraction, wherever you go. Completing the package is an inline control and microphone, as well as a solid aluminum frame with braided cables for tangle-free management. *Compatible with phones running Android 6.0 and above such as Razer Phone 2, Razer Phone, Huawei P20 Pro, Google Pixel 2 XL, Samsung Galaxy S9, Samsung Galaxy S9+, Samsung Galaxy Note 9, Samsung Galaxy S7, LG G7+ ThinQ, Xiaomi Mi 8, Xiaomi Black Shark, Vivo Nex S, HTC U12+, Oppo Find X, OnePlus 6 and many more. For more information about the Razer Raiju Mobile, please visit https://www.razer.com/raiju-mobile. For more information about the Razer Hammerhead USB-C ANC, please visit www.razerzone.com/razer-hammerhead-usbc-anc.